Enabling businesses to conveniently verify a user’s age at any touchpoint – digital or physical. In order to access certain services or purchase certain products, users are regularly required to verify their legal age – in the physical as well as the digital world. The associated age restrictions apply to products such as alcoholic beverages and tobacco as well as digital content and services such as media subscriptions, video games, adult entertainment or online gambling. This predominantly serves the protection of minors. In most cases, a user has to repeat the age verification process with each new service, platform, or online shop, which inevitably involves the repeated disclosure of personal information. This has a negative impact on user experience in terms of convenience and privacy. For businesses, a thorough age verification process means higher expenses and may lead to lower conversions rates resulting in higher customer acquisition costs. Also, additional legal risks may arise from vastly varying territorial regulations regarding the handling of personal data and youth protection. A seller or delivery agent who unknowingly hands an age-restricted product to a minor can face serious financial and personal consequences. The ​Keyp Identity Terminal​ enables businesses to conveniently verify a user’s age at any touchpoint – digital or physical. 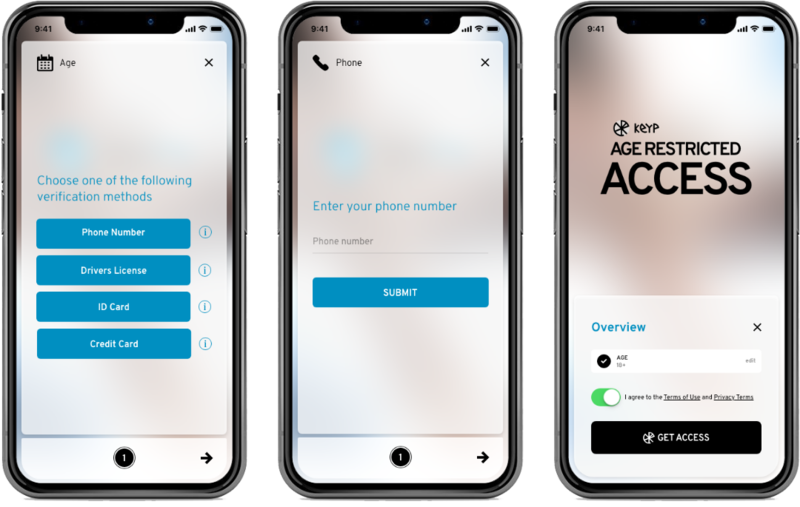 A verified age attribute is stored locally on the user’s device and can be reused with a single tap to gain access to a digital service or to be given a physical good in a retail location. In a web browser, this even works seamlessly across multiple tabs and services. A user is buying a bottle of whiskey on their laptop. Upon checkout, the user is asked to verify their age. Using the ​Keyp Wallet​ the user scans a code from the screen and the age verification process starts. The eCommerce shop can designate the specific ​Identity Provider​ (IdP) offering several options for age verification such as phone number, driver’s license, ID card, passport or credit card. After the initial verification, the credentials can be reused seamlessly across multiple domains. Online shops receive an anonymous age confirmation without disclosure of the user’s name or birthday. Upon delivery of the whiskey, the recipient scans the parcel with their smartphone. The user provides the same age credential using the K​eyp Wallet ​app and authenticates via face recognition, which is the required authentication method by this particular delivery service. Users can also reuse this age verification at POS of retail locations, where a beacon or QR code may serve as trigger for the process. None of the businesses involved have to worry about privacy regulation as no personal data has to be stored. In case of concern of later disputes, an encrypted transaction record can be stored by an audited third party. This way, age verification through ​Keyp​ protects both users and businesses – anywhere, anytime. Find further info here on Keyp’s plug & play age verification for adult entertainment online.